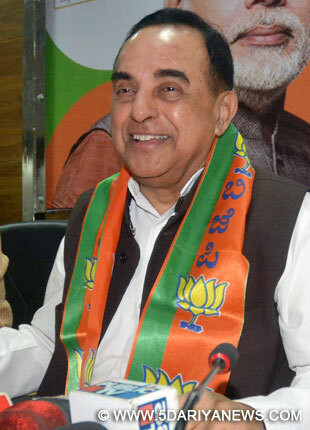 After an affidavit from the government in the Supreme Court accused Subramanian Swamy of a 'hate speech', the BJP leader on Tuesday said he will talk to Home Minsiter Rajnath Singh about it.According to reports, the home ministry has filed an affidavit in the Supreme Court against Swamy, saying that a book written by him "promotes hatred between Hindus and Muslims in India".The affidavit said Swamy's book "Terrorism in India" released in 2006 violates rules on hate speeches.Swamy slammed the affidavit and said he will file a counter affidavit. "If they have filed any affidavit, I have a counter affidavit. I don't even know if the home ministry or law officers prepared the affidavit and got it signed by an under secretary," Swamy said. "I have got to know no one in the home ministry is aware of this. I will talk to Home Minister Rajnath SIngh tomorrow (Wednesday)," he said.He said the section 153 A, under which the plea accused him of a hate speech, was "unconstitutional" and "draconian".